St. Patrick's day is Saturday and I'm celebrating early with this "green" cottage. I mean, except for the walkway and stone wall, the roof, the walls of the cottage, the sky and a few flowers, everything is green. Very Irish, right? I would love to know what those large green top-of-a-pineapple looking plants are. They're almost like a yucca. But yuccas in Ireland? Hmmm. I'm sure one of my cottage friends will be able to tell me, so I'll wait for your comment to find out. Whatever they are, they're gorgeous. As is the rest of the landscape. 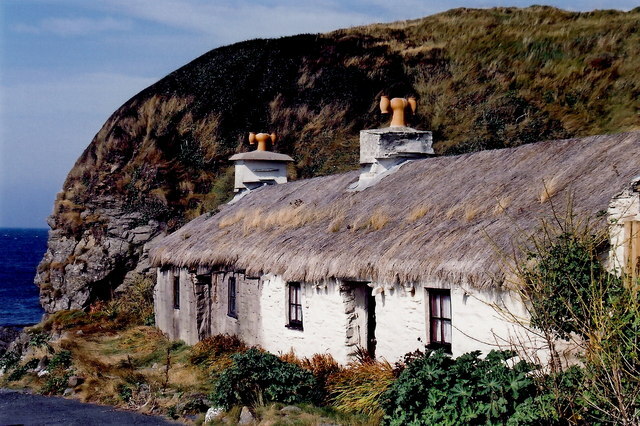 If you've seen the movie "Waking Ned Devine", you may recognize this quaint Irish cottage. It was featured in the film as Ned's cottage. A cottage by the sea is my idea of a dream come true. 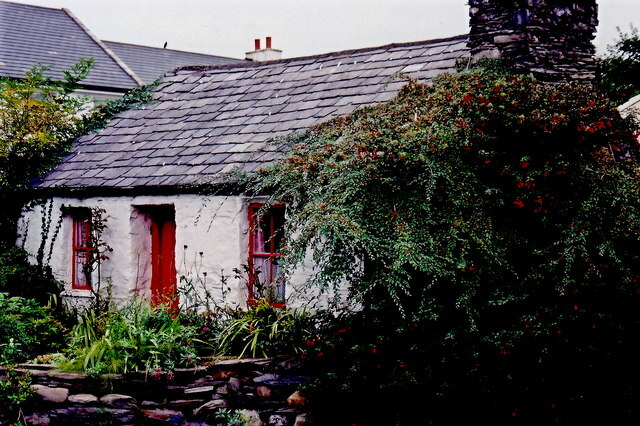 I love the red door and trim on this Irish cottage. Seriously, that is RED. Stunning. And since we should always have something cute in our cottage to look at. 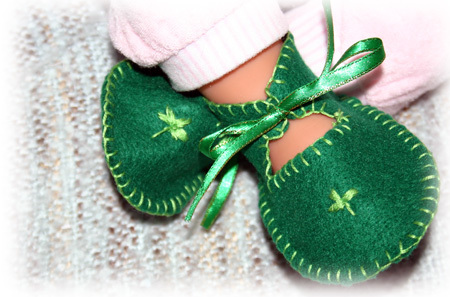 . .
How about these adorable shamrock shoes? Are they not the cutest thing ever? I'll tell you where I found them later. Oh, maybe I should tell you now. . .no. Yes. No. It'll be hard, but I'm going to wait. Have a very Irish week. Nancy, I'm so happy to see your smiling face today. Endearing is the word. You're right! The cottages are wonderful. Makes me want to runaway! Let's pack our bags and go! :) Hope you're having a good day today, Jill. Oh Nancy !! 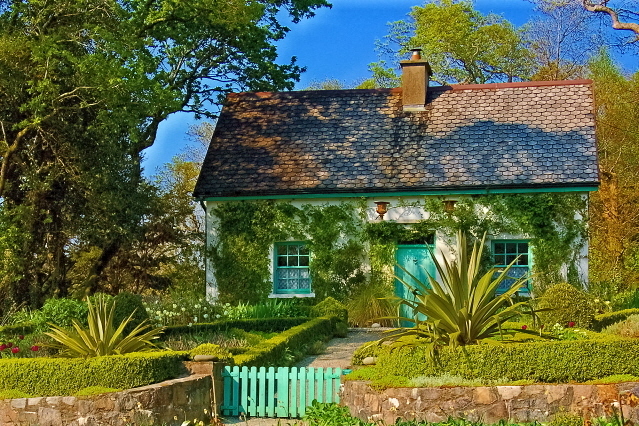 I love these Irish cottages with the beautiful trim colors. Beautiful. I will be waiting to hear more about the magic slippers!! Thank you for the smiles. Hello lovely Renee! Thanks for stopping by. Charming post . . . loved, loved the green cottage! And the little leprechaun green shoes are adorable . . .
You're the winner of my giveaway! Go to my blog and click on the contact link, from there you can email me your address so I can mail you your treasures! Such lovely Irish cottages. The green shoes are adorable. Oh, Waking Ned Divine is one of my favorite Irish movies, and I do remember the cottage! I LOVE the one you show here that's on the Isle of Man, though. Yes, a cottage by the sea would be divine indeed! Such cute little shamrock shoes!